We were invited by a friend of ours, Kier, who is from Laguna himself. He actually do tours in Laguna, But since he's our friend, we had a free tour without the comfort of the van and pack meals. 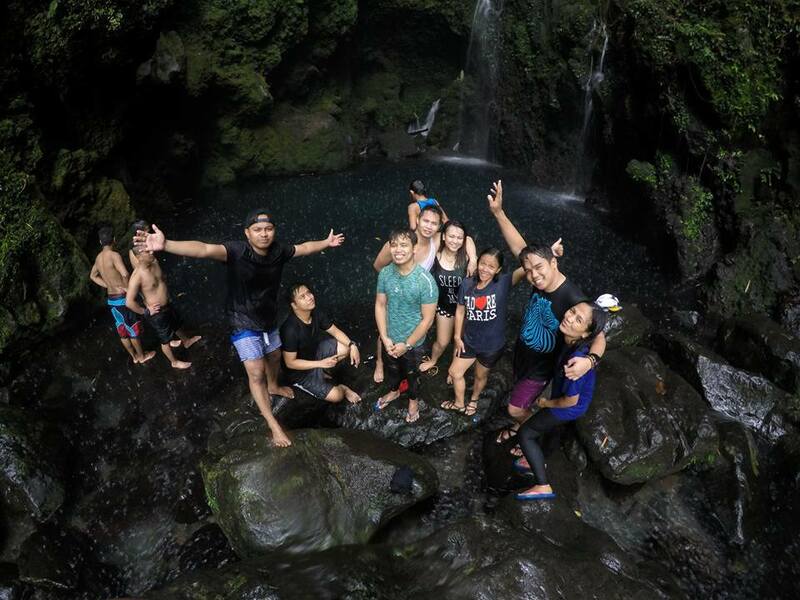 But nevertheless, we had the love and laughter in the waterfalls of Laguna. Since we are on a commute mode and in order for us to maximize the day, we left early for Sta. Cruz, Laguna. Leaving early means like 4amish or even 3amish... Yeah that early if you do not have your own car. For our part we left Buendia at around 4AM and arrived in Sta. Cruz Laguna at around 6AM. We took a big jeep in Sta. Cruz bound to Lucban, Quezon and dropped off to where a big signage of Hulugan Falls is located. Its as if its a common knowledge among drivers to drop off passengers at that location. You'll never get lost if you do DIY waterfalls chasing in Laguna. That was a roughly 20 minutes ride from Sta. Cruz with scenic view of rivers, winding road and people of the town walking by the road. While waiting for some negotiations going on between our guide, Kier, and the guide to the falls, we bought some cheesy Bibingka packaged in mini Pandan basket. Do not forget to buy this when you visit Laguna. Its a must try! We started the trek at around quarter to nine and we arrived at our first destination - Talay Falls - after 20 minutes of mild and enjoyable trek. Talay falls is not for swimming or I guess we just did not tried ;) The water is not inviting but scene made by the waterfalls, the rocks, the moss on the rocks, the trees and the sound of nature made it perfect getaway from the smell of the diesel and the shouting EDSA. It was a challenge for us to trek down and up the slippery rocks just to get that perfect vantage point of the falls. So every pictures are true to the famous term "Buhis Buhay"
The falls that's no longer hidden. We were like searching for the inner being of the Forrest. Every roots of the tall and old trees seems like the vein of the mountain we were holding on to reach our destination, It was indeed a very challenging trek... but it was all worth it after all. Nobody wants to be left out so we all went bouldering to see the falls up close. With no harness and safety gear we all hold up to our excitement and faith that the rough rocks will save us from falling. The real challenge was becoming quite clear to us when we head towards the famous Hulugan Falls. Steep and muddy trail was obviously making it hard for us to trek. Nevertheless nobody says anything but we all can do it. We reached the falls with relief and much anticipation. We saw raindrop like water falling from the top. There are plenty of people relaxing to the view of the waterfalls. As for me it was like, at last, I saw it! After months of seeing friends in social media dipping in the Hulugan Falls, now I finally see it my self! According to our guide the current was not that strong as compared before. It was my first time to visit Hulugan thus I do not have any idea what really it look like. The mist of the water can actually go as far as the rock that seems a boundary he said. That I think is like 300 meters from the falls itself. Hulugan Falls is in Luisiana, Laguna. We did not have a pure disappointment at all at Hulugan Falls. 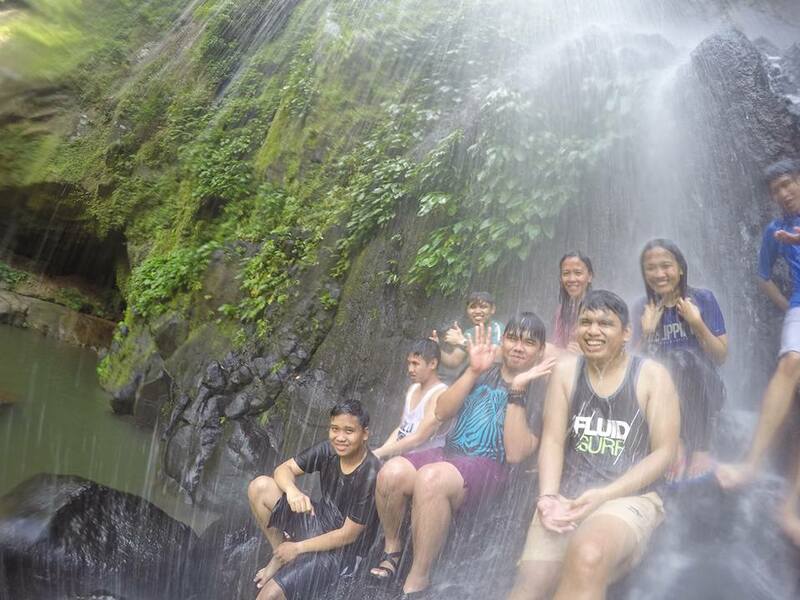 But our guide promised us that we will enjoy the waters of Bukas Falls in Majayjay, Laguna. But the heaven told us that we should come back there in Bukal Falls. The water of Bukas Falls is as cold as ice. Try match it with the cold rain... the result would be whew!!! We still enjoyed the waters of Bukas Falls under the rain. Too bad we could not jump from the cliff because it was dangerous. Right after Bukal Falls we made a promise to visit Majayjay Church. The 17th century Romanesque church is worth the visit not only because of its grandeur style but also because its like paying homage to the province heritage whenever you visit. We went back to Pansanjan after our waterfalls chasing to eat dinner before we cap off the day. Balai Ilocos in Pagsanjan, Laguna is one of the most adorable restaurant in Laguna especially for old houses enthusiast like me. It is an old house converted into a restaurant. 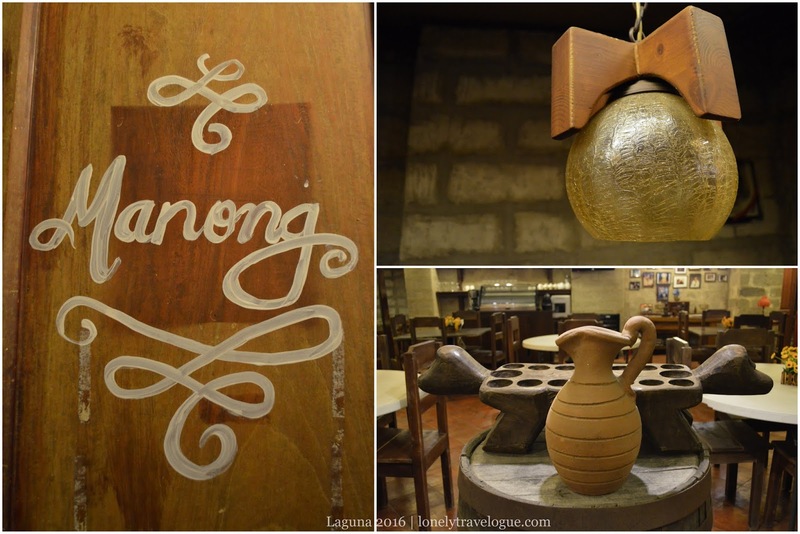 They serve Filipino food like Sinigang, Binagoongan, Pinakbet, Kare-kare and other famous Pinoy dishes for a very affordable price.